Do you ever run out of blog post ideas? Do you find yourself in front of a blank computer screen with a blinking cursor (or piece of paper for those of you who like the old school approach)? The real trick is to capture and record your blog post ideas whenever and wherever you get them. Yes, it can be a bit like trying to catch a fleeting butterfly. Yet this small step can help you avoid what I call “wandering in the desert.” This is the seemingly endless task of writing a blog post when you have no inspiration or direction. Even worse, you’re up against a publishing deadline. Just having a blog post idea isn’t always enough. The problem: Not all blog inspiration is created equal. Instead, you need a qualified blog post idea. That’s a post concept vetted against data from past results and analysis. Then you know that your audience will find and read your blog articles. 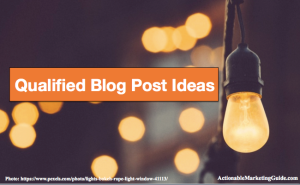 To help you find qualified blog post ideas, here are 3 places to look within your blog and your organization more broadly. I know you’re seeking new blog post ideas. But--you must know what your target blog audience likes and dislikes about your current blog content to ensure your new article concepts are qualified. Which of your blog articles get the most views? Chances are these posts outrank your homepage. It will probably include your foundational or pillar content. Analyze these top posts to understand why they’re so popular. Then you can create related articles on the same topic or using the same format. Has your audience grown sufficiently that you can repost it to attract more readers? Boost Blog Traffic does this. It helps to add a note. Can you update any of these top performing posts? 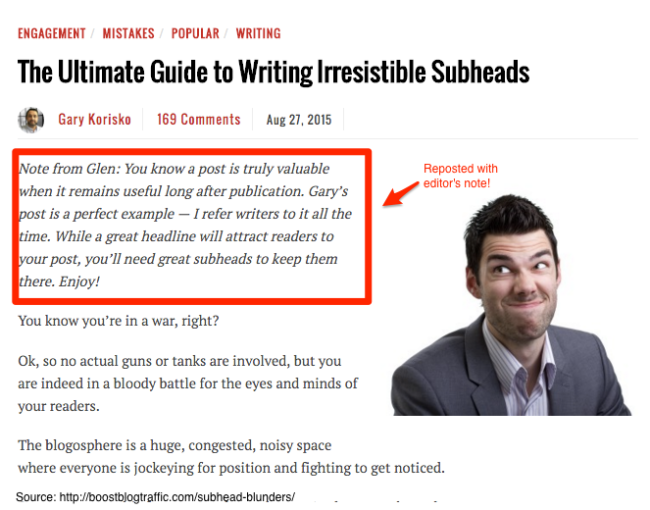 This is useful since it gives your post another chance to be in your reader’s limelight. Can you write a related post? Buffer updated The Optimal Length of Every Social Media Update and More post with a related post containing an infographic. They enhanced the new post with additional information and linked the 2 posts together. Is there a post format you can apply to new articles? For example, listicles or roundup posts. Is the topic meaty enough for you to develop related blog post ideas? At a minimum, write what Andy Crestodina calls the evil twin post: Take the opposite point of view of your existing one. Alternatively, can you create a related post series? Then you can write an introduction post and conclusion post. Which of your blog articles get the least views? These blog posts are your duds. Instead of burying them, examine what made them perform poorly. Determine if these articles have something in common that you can’t see when you look at them individually. Understand what makes these posts different from your most popular ones. Is the topic tired or, even worse, just a me-too post? If so, consider redirecting them to more relevant content. Is the post outdated? If so, update the information to make it relevant. Can the post be improved with an overhaul? If the post is the victim of weak writing or flabby prose, then you can fix it easily. Does the post need blog bling? Is it boring due to a lack of eye candy? Add images, gifs, infographics, presentations, screenshots, charts, or videos. Is your post optimized for readers? Rewrite the headline, add bolding and outlining, and use simple language. Don’t cover your ears. I know the word audit instills a sense of fear, especially this time of year. Like spring cleaning, you need to audit your content to find hidden gems of quality blog post ideas. While this article is focused on your blog content, a content audit applies to all of your content. Are there holes in your content offering? These are subjects or products you haven’t covered. If so, each one can be a blog post idea. Which content can be updated? Is there old blog content that needs new data or products? Keep the URL and amend the information. Look for blog posts linking to old products and change the content to reflect your current offering. This is similar to the updates mentioned above. Which content can be extended? Is there an opportunity to create related content or series? These are new qualified blog post ideas. Make sure that you link the articles and alert readers that they’re connected to help increase time onsite. Can you curate a set of older articles to create new options? 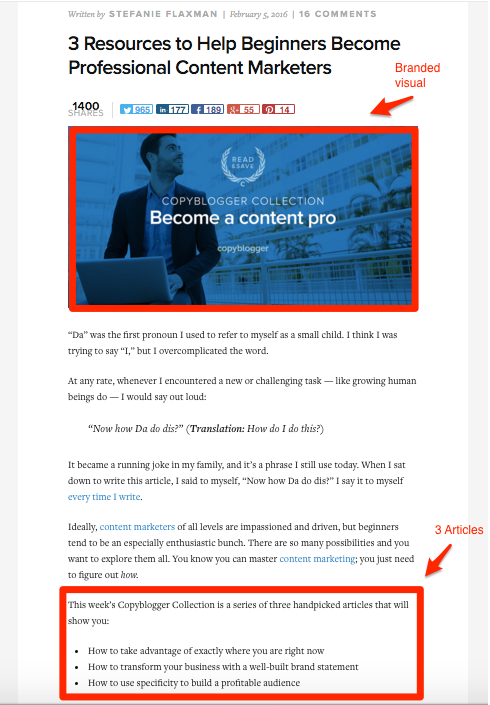 Copyblogger regularly puts 3 related articles together with a common theme. There’s a new introduction and blurb about each one. They use a consistent graphic. Do you know what information prospective readers seek from your blog? Just because you optimized your blog posts for specific keyword phrases doesn’t mean your potential readers use them. I’ve worked for companies that used different language from their prospects and customers when talking about our products. Are you doing this without realizing it? Examine the search terms prospective readers use to find your blog content. Is there content that visitors expect from you that you don’t provide? List these terms. Create blog post ideas around each set of keyword phrases that are missing. Do visitors find your blog via search but leave immediately? Assess this content. It needs to be aligned with reader expectations. Either rewrite or modify the blog posts to fulfill your readers’ search expectations. Can you create additional content around the words your audience searches? 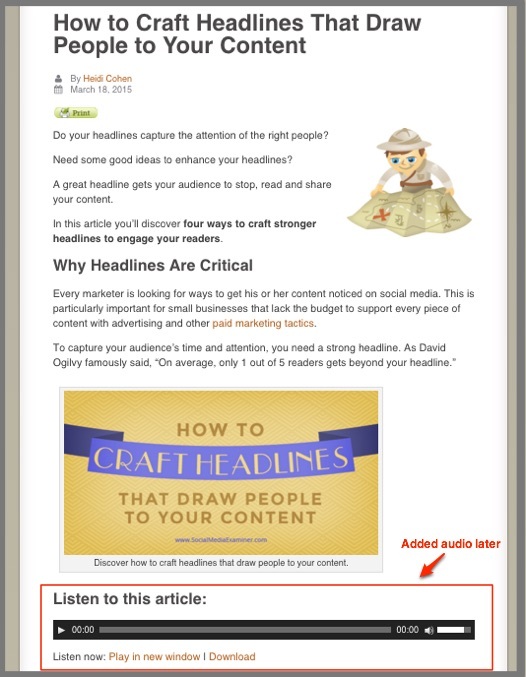 Add qualified blog post ideas for related content. Include how to’s, photo galleries, interviews, influencer input, customer input, and case studies. Examining your analytics, content audit and search results should provide you with a list of qualified blog post ideas for new, reposted, updated and curated content. Don’t just let these ideas to go unnoticed. That would be a wasted opportunity. Especially since some of your content creation work is already done! Add these new qualified blog post ideas to your existing blog post idea list. Also, add the content updates and reposts to your editorial calendar. They often require less blog post creation time. Use them to keep your publishing schedule on track when you need breathing room in your schedule. Unlike fresh blog post ideas, these blog ideas are vetted by your blog history. They’ve got a fighting chance of attracting readers before you write the first word of the post. BTW, want additional blog idea help? P.S. Here are 125 Blog Post Ideas. Tags Andy Crestodina, Boost Blog Traffic, Buffer, Copyblogger, Editorial calendar, Persona, qualified blog post idea, Social Media Examiner. Bookmark the permalink.